Irving, Texas – July 1, 2015 — Four Js Development Tools announces the availability of Genero Report Writer for Java, C#, and PHP. Now developers of all confessions can reap the benefits experienced by Genero developers since its launch on April 16, 2009. There’s a gap in the market for a publishing system that serves developer needs. We aim to fill that gap. provide tight integration between applications and reports – many developers wish to control every aspect of report production. Developers are ready to ‘democratize’ the process of report production as long as they maintain firm control of the data source. This new release is the result of close collaboration with developers and the implementation of their ideas. The diagram below illustrates Genero Report Writer’s position within the market. While Genero Report Writer satisfies many of the ‘ad-hoc’ tool features, its target audience is essentially developers, graphic designers and support staff assigned to the task of report production and maintenance. The vertical axis describes enterprise-class features, whereas the horizontal axis describes ‘ad hoc’ features. Performance features such as streaming high-volume reports: printing starts immediately – irrespective of the report size. Create reports quickly using the Template Wizard that enables the editing of existing report designs to create new ones. This eliminates the need to start each new report from scratch. A constant memory, linear-time, RTL streaming transformation language minimizes compute resources such as memory, CPU and network bandwidth. No need for voluminous temporary files. Reports are processed without latency using a sliding window of limited memory size. 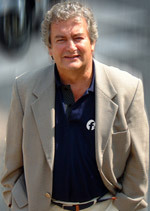 Data produced by the application is processed progressively by all involved components right to the browser or printer. Data and presentation layers are separate, permitting clear delineation between developer and graphical designer activities. In this way, each domain may be performed by experts with very different skill sets; data architects for the data set, and graphic artists for the report design. A surprising number of every day documents such as invoices comprise complex data structures. Define data models according to your business requirements rather than adapting them to the limitations of the report formatter. Both Report Designer and Report Engine cater for deeply structured data, elegantly and efficiently without resorting to resource hungry ‘tricks’ such as sub-reporting proposed in other products. Dynamic layouting enables a single report to adapt to different output parameters: font changes, field values, international languages, paper sizes and orientation, while ensuring a perfect document every time. Embed your reports seamlessly into your app using one of the supported language APIs: Java, C#, and PHP. Select data from any source the programming language can access. Input from databases, pipes, sockets, files, messaging or web services. Print soft copy reports to Web browsers, MS® Word®, MS Excel®, Acrobat®, SVG® as well as any printer. Do basic analytics using MS Excel’s pivot tables. SVG data can be streamed to browsers with low latency to Linux, Mac and Windows clients. 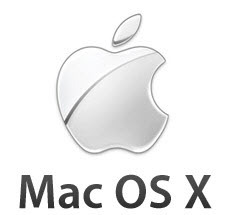 Formats such as Acrobat, MS Office® or Open Office® by their nature are not streamed and are saved to disk before printing. Report Engine’s low-latency architecture produces thousands of pages that consume minimal server resources. 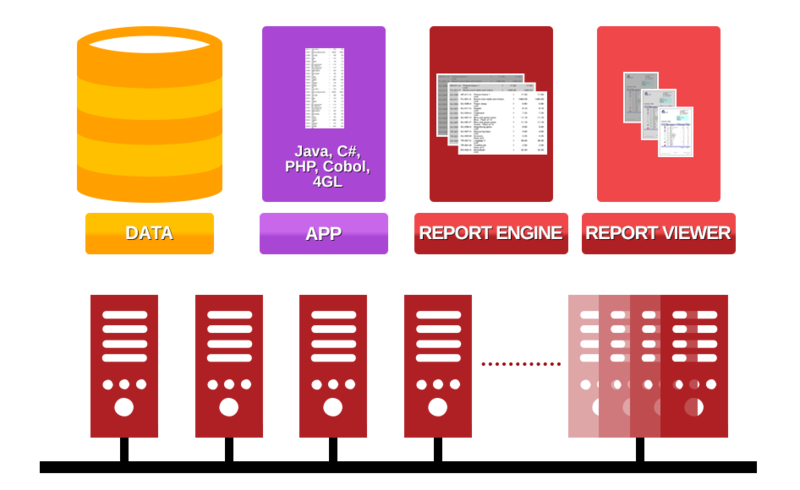 Nevertheless, for compute-intensive reports or geographically dispersed data sources, Report Engine can be distributed across the network and perform load-balancing to keep throughput constant. Boost productivity by working with document types rather than proliferating closely related individual documents. Most reports are just iterations of existing ones using the powerful template feature that enables many reports to be tailored from a single model. 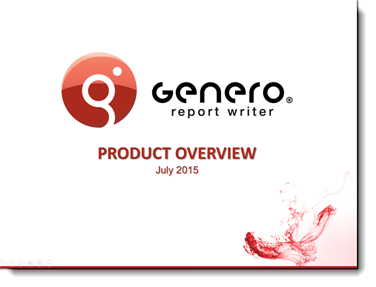 Genero Report Writer accelerates report production by democratizing the process of report creation. Custom reports are created in hours rather than days using Report Designer, eliminating the need to code them by hand. Genero Report Designer uniquely combines simple WYSIWYG principles used in ad-hoc reporting tools with the sophistication of complex document reporting. Its intuitive drag and drop interface supports absolute and relative positioning of report objects for ‘responsive’ dynamic layouting. End users can can now satisfy most of their needs with designers and support staff without the need to disturb the development team. Reduce the number of reports to be managed significantly by consolidating them into a single design. Most enterprises have thousands and thousands of files. that are largely redundant. Using Genero Report Writer’s template library, you’ll reduce the number of reports by an order of magnitude. 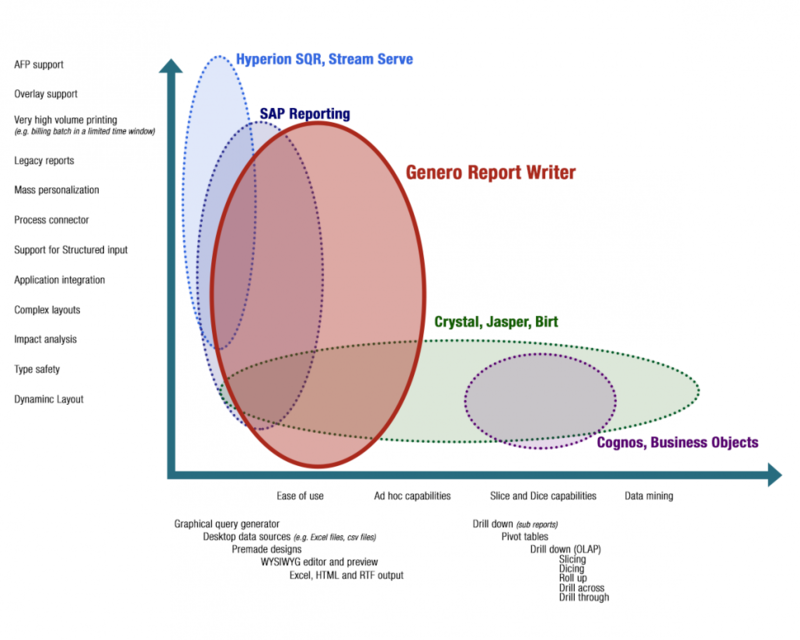 Genero Report Engine is CPU and memory efficient due to its fine-tuned streaming architecture. Unlike rival products, it can sit on the same machine as ther application, eliminating the need for dedicated report servers. Templates, dynamic layouts and translation tools all drastically reduce the number of reports that need to be maintained. This combined with readable XML document sources, close design-time validation error checking for instant ‘change impact discovery’, reduces the need to debug runtime errors in the field. Command line tools are available for batch validation and report updates. Save valuable developer time by delegating report design and edits to graphic designers and support staff that can safely customize templates without developer involvement. This significantly reduces the backlog for user requests and frees-up scarce developer resources for more value-added feature development. Genero Report Writer may be deployed in a single or multi-server configuration, depending on the workload or topology of the organization. In most cases, a single server will suffice. Genero Studio generates report libraries (classes) that are linked into your application. The application executes this code which extracts raw data from the given data source(s) and streams it to Report Engine. Report Engine applies the report design, formatting and paginating the data stream for the viewer, whether it be a browser, Word, Excel, Acrobat or Genero Report Viewer. If Report Viewer is selected, then data is streamed and reports appear immediately as each page is produced, leaving the user to freely navigate up and down the report. The diagram below describes this runtime dataflow. 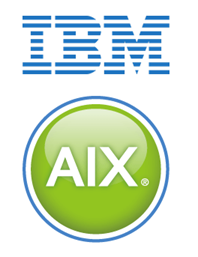 For extreme loads, it is possible to distribute and load balance the work over multiple servers. Create report data sources using a visual database query designer and create graphical report designs from pre-defined templates models. Transforms raw XML data into formatted, paginated output. Lets graphical designer modify existing reports or templates on-site. Insert/delete data fields and columns. Insert new graphics, rework layout. Render formatted Genero Report Engine data stream into native client desktop format (browser HTML5).